As a rejection from PET bottles adults use more and more often refillable bottles on the go and equip their children with the practical drinking bottles. Whether for the office, university, sport or on the go, filled with water, spritzer with apple juice, black currant juice or cherry juice or other mixtures you have always your thirst quencher with you. For lovers of hot drinks pollution-free hydro flasks insulated bottles are offered. Instead buying sugary sodas on your way or in the canteen, with this durable water bottles you save money and the environment. Almost every child has a bottle in its kindergarten bag or school bag. Eco-conscious parents give their offspring practical drinking bottles made from bioplastics, stainless steel or glass coated with a neoprene suit – after all the child shall take its favourite drink free of plasticizers, BPA and phthalate. But not only being without harmful substances is an important criterion. Thus the juice or tea does not flood the children’s bag or briefcase, they should be leakproof. And of course, the bottle should last a long time and should be recyclable. Combined you find these properties in three materials: glass, stainless steel and bioplastics. For each material greenpicks.de/en has recommendations – based on our practical experience and the feedback from the Greenpicks community. Always have a drink of water on hand, whether on the way home from the office or in the gym or while jogging. The double wall construction ensures that drinks stay cold up to 6 hours or hot up to 24 hours. BPA-free and without Phthalate. The Hydro Flask Insulated Stainless Steel Bottles fullfill 5 of 11 possible Greenpicks-Sustainability Criteria. Chic and simple – this describes the look of 24bottles. The stylish Urban Bottle is available in bright colours or in satin stainless steel. The drinking bottles are free of toxic BPA and uncoated. Stainless steel is also recyclable without loss. 24 Bottles stainless steel bottles fullfill 4 of 11 possible Greenpicks-Sustainability Criteria. The sport cap is as unique as the dopper. Its design uses a flexible material that can be folded back, allowing for easy access to the nozzle cap. Dopper wants to raise consciousness with regard to the impact of single-use plastic waste, which is why the new cap can be used on your current Dopper. So no extra bottles in your cupboards – all you need is an additional cap to get a new use out of your Dopper. The Dopper contains no bisphenol A and other harmful substances may therefore lead the marking "food grade". Due its weight the Dopper might be the first choice for sports and for hiking. The Dopper fullfills 7 of 11 possible Greenpicks-Sustainability Criteria. 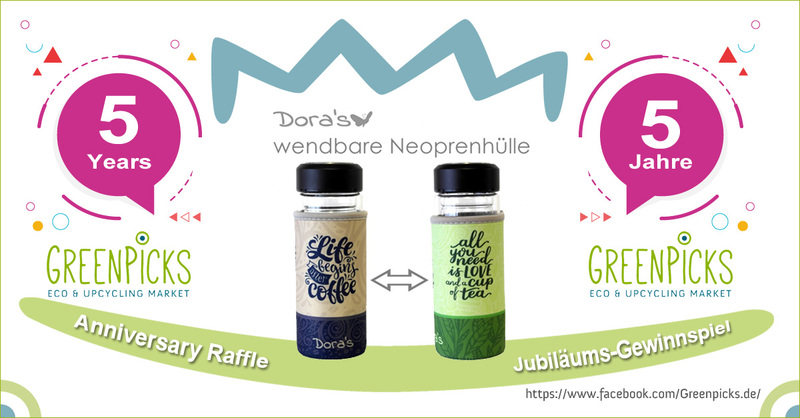 The advantages of Dora's bottle in a colourful neoprene case are convincing: glass naturally contains no harmful plasticizers, phthalates or BPA. Glass bottles can be reused countless times and can be recycled at the end of the period of use. Also glass bottles with cotton-felt sleeve are available. The glass bottle with neoprene sleeve fullfills 2 of 11 possible Greenpicks-Sustainability Criteria. The THANK YOU water bottles are real recycling bottles. The glass bottle is made of 40% recycled white glass. The cork sleeve is made from waste bark granules and natural cork bark. Perfect for long meetings or lectures or all kinds of sports, hiking, or just for those who are thirsty all the time. The affirmation THANK YOU is burned into the bottom. Fits into your backpack or bottle holder in your car. Designed according to the Golden Ratio and with affirmation THANK YOU burned into the bottom. Drinking bottles THANK YOU from Natures Design fullfill 4 of 11 possible Greenpicks-Sustainability Criteria.